The basal neotheropod Coelophysis bauri, latest Triassic of central western Pangea. The clade Neotheropoda was first coined by Bob Bakker (1986), and further defined by Sereno, 1998 and Nesbitt 2011. Basically this group includes all theropods other than a few very early primnitive ones, and also other than the Herrerasaurs (which are so close to the ancestral stem of dinosaurs that they may or may not even be theropods; alternatively, proto-theropods might be considered the original line from which all other dinosaur types evolved). Coelophysids, dilophosaurs, ceratosaurs, allosaurs, tetanurines, allosaurs, coelurosaurs, tyrannosaurs, maniraptors, and birds, are all, technica;lly speaking, neotheropods. Indeed, such is the taxonomic uncertainty around the stem of the dinosaur family tree that the demarcation between neotheropods and theropods may not be clear. However, we have followed Nesbitt 2011 in recognising the Neotheropoda as the clade including Coelophysis, modern birds, their common ancestor, and all its descendents. In other words, all theropods above the herrerasaur, Eodromaeus, Eoraptor, Daemonosaurus, and Tawa grade. Admittedly it seems pretty silly to refer to 99.999% of theropods and about 95% of their evolutionary history as "-neo" (new), but cladistic nomenclature often comes up with irritating jargon (e.g. Pseudosuchia (false crocodiles) a sthe calde that includes true crocodiles), and rather than use little known alternatives like Eutheropoda or the splendidly appropriate but unfortunately junior synonym Avepoda ("bird feet") (Paul 2002, Paul 2010), we have decided the easiest course of action is just to go with the consensus. The earliest and most primitive of the neotheropods are a broad assemblage referred to as ceratosaurs. Ceratosaurs were one of the first clades (as opposed to linnaean ranks) of dinosaurs to be named (Gauthier 1984), along with its sister taxon the Tetanurae (Gauthier 1986). They often feature unusual crests on their head, perhaps a device for intraspecific rivalry or mating. They seem to have become extinct during the end Jurassic in Laurasia, although if abelisaurs are Ceratosaurs (and this is generally stated but still not certain), than these animals survived in Gondwanaland right up to the end of the age of dinosaurs. Only a decade or two ago the Ceratosauria were accepted in mainstream dinosaurology to be a monophyletic group (e.g. Rowe & Gauthier 1990). A 1994 analysis by Holtz follows Gauthier in having the coelophysoids and neoceratosaurs forming a clade (Ceratosauria), and together forming the outgroup to Tetanurae. Very soon though, cracks began to appear, and it was suggested that these two taxa may not form a clade exclusive of other known theropods (e.g. Rauhut 2000). There are also some derived features found in neoceratosaurs (Ceratosaurus and Abelisaurs) which are not found in coelophysoids. This would be evidence that neoceratosaurs are closer to tetanurines than to coelophysoids. In this case, the neoceratosaur/coelophysoid characters would have to be convergences and/or primitive neotheropod features lost in Tetanurae, and the Ceratosauria are paraphyletic or even polyphyletic. It is now looking increasingly likely that all the Ceratosauria as originally defined, and for that matter its included subclade Coelophysoidea (which includes the (families Podokesauridae (better known as Coelophysidae) and Dilophosauridae), are a series of smaller clades (Yates 2006, Smith et al 2007), or even a paraphyletic assemblage or an evolutionary grade, rather than monolithic clade (Nesbitt et al 2009, Nesbitt 2011). This also makes sense from a stratigraphic context, as otherwise we are burdened with innumerable ghost lineages and non-existent ancestors, when the ancestors (or at least their close cousins) and transitional foms were before us all the time. Time calibrated phylogenetic relationships of basal theropods. "Coelophysoids" are here shown to be a paraphyletic group. The asterisk indicates an alternative placement of Zupaysaurus as sister taxon to Dracovenator, according to Yates (2005); dotted lines indicate uncertain position of herrerasaurids and Eoraptor according to Sereno (1999) and Guaibasaurus according to Langer & Benton (2006). Diagram and caption from Langer et al 2010 fig 17. Neotheropoda:(=Coelophysoidea? 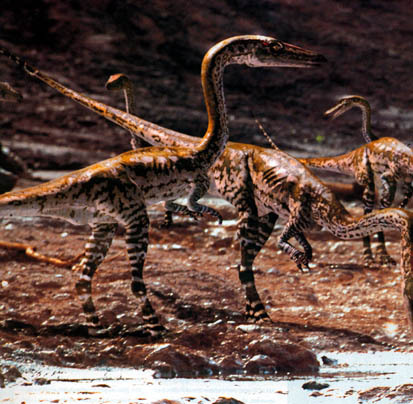 ): Coelophysis, Dilophosaurus, and more derived theropods. Pigeons > Prototheropods. Range: Late Triassic to Late Cretaceous. Phylogeny: Theropoda ::: Tawa + * : Podokesauridae + Liliensternus + (Zupaysaurus + (Dilophosaurus + ((Neo)Ceratosauria + Tetanurae))). Characters: clavicles are fused into a single mid-line bone (furcula or "wishbone") that functioned as a spring/shock absorber, perhaps to deal with stresses on the forelimbs and shoulders from struggling prey. (It is not known whether or not Tawa, Eodromaeus, and even the herrerasaurs had furculae. ); Manual digit V lost (so only four fingers or fewer); Five or more sacral vertebrae; Increased pelvic muscles, revealed by increase in size of attachment surfaces on ilium; Pedal digits I and V reduced (making the foot functionally tridactyl ("three toed"): metatarsal V lacks a toe, while metatarsal I is reduced with a small digit I (Tom Holtz). Links: (the following is for Ceratosauria - these links haven't been checked and in any case need to be sorted taxonimically updating MAKDinoData: Ceratosauria; DinoData: Coelophysis; Coelophysis; Staab Studios - Coelophysis Model; The Fernleaf: Karen Carr; Ceratosaurian Theropods; Ceratosauria (Mikko's Phylogeny); Ceratosauria Dutch -- brief introduction & chart); A BASAL ABELISauria NOVAS, 1992 (Theropoda- CERATOSauria) FROM ... full text paper on relationships); Megalosaurus = Torvosaurus in Europe and following); ceratosauria.html Justin Tweet); Dinosaurier Interesse.de - Stanley- Ceratosaurier German); GEOL 104 Lecture 22- Theropoda I- Dinosaurs red in tooth and claw lecture notes from Tom Holtz); Ceratosauria. ATW030313. Definition: As originally defined, Podokesauridae was an evolutionary Linnaean taxon (and can still be used in that context). Sereno proposes a number of nested clades here, using Coelophysidae rather than Podokesauridae (see also comments section for reason for name changes), as follows: Coelophysoidea: The most inclusive clade containing Coelophysis bauri (Cope 1889) but not Carnotaurus sastrei Bonaparte 1985, Ceratosaurus nasicornis Marsh 1884, or Passer domesticus (Linnaeus 1758). taxon search. Coelophysidae: The least inclusive clade containing Coelophysis bauri and Procompsognathus triassicus Fraas 1913. taxon search. Coelophysinae: The most inclusive clade containing Coelophysis bauri but not Procompsognathus triassicus. taxon search. Unfortunately Procompsognathus is not a good choice of anchor taxon; it is a poorly preserved form that, depending on who you ask, might be a chimera (in this case a sphenosuchian skull and podokesaur skeleton), a non-Dinosaurian ornithodiran, or an unspecified ceolophysid (Wikipedia, see elso refs cited there), so the last two definitions are not of much use. Segisaurus halli Camp, 1936 may be a better choicxe, but even there the skull is missing, so detreming the precise relationship is difficult. How many species are included in the stem-based definition of Coelophysoidea depends on whether this assemblage of early theropods turns out to be a monophyletic or a paraphyletic group. Coelophysis bauri, Denver Museum of Nature and Science. Characters: The following are characteristics of the "Ceratosauria": Maxilla & premaxilla weakly attached; large tooth from lower jaw fits into marked diastema; no maxillary fenestrae; $ 2 pairs of pleurocoels in cervical vertebrae; $ fusion of sacral vertebrae & ribs (adults); retain 4 digits in hand; $ 2 fenestrae in pubic plate; $ flange at distal end of fibula overlaps ascending process of astragalus anteriorly. ATW (no date). Comments: Coelophysoidea was known as Podokesauridae until as recently as Carroll 1988. Paul 1988 points out that the original fossil remains of Podokesaurus, whose phylogenetic status was debatable to begin with, was lost in a fire, and all that remain are some poor quality casts. On those grounds he proposed renaming the taxon to reflect the better known Coelophysis. Holtz (1994) and Sereno (1998) formalised the terminology (although the family rank taxon Coelophysidae apparently goes back to Nopcsa 1928. Unfortunately, Baron von Nopsca was only familiar with Cope's Coelophysis, which was a Silesaur proto-dinosaur, and not Colbert's small Ghost Ranch theropod, which was a totally different animal, despite being assigned to the same genus. What's more, there is no requirement for the type species or type genus of supra-specific taxa to be based on good material for it to be valid - consider Phytosauridae for example! We have therefore followed Olshevsky 1991 in restoring von Huene's original taxon name (Matthew Martyniuk has also recently argued in favour of restoring Podokesauridae). Actually this is in keeping with a general trend in dinosaurology, in which over the past two decades or so taxa based on poor material are first renamed and then have their original moniker restored. So Megalosauridae changed into Torvosauridae and even Spinosauroidea before becoming once again Megalosaur-idae/oidea, and Titanosauridae spent several years as Saltosauridae before again returning to Titanosauridae. Hence Podokesauridae is used here in preference to Coelophys-idae/oidea. Life reconstruction of Coelophysis bauri, by John Conway. The Podokesaurs are the most primitive of the neotheropods, and this linnaean/evolutionary taxon is certainly paraphyletic (i.e. it is the ancestral grade of all higher theropods - if one were to draw a romerogram it would be the bubble at the bottom from which the bubbles or balloons derive. Greg Paul divided these early theropod dinosaurs into two groups, the smaller Coelophysines and the larger Halticosaurines (the Dilophosaurs). (Paul 1988). A recent cladistic analysis reveals that the Halticosaurines are an artificial grouping, with some (Liliensternus and Lophostropheus) more primitive than both the smaller coelophysines and the Jurassic dilophosaurs (Smith et al 2007). A revision of Triassic stratigraphy by S. G. Lucas (1998) shows Coelophysis bauri to be late Norian or Rhaetic (latest Triassic) in age, rather than late Carnian as originally stated, so that it lived after both the large Liliensternus and small Procompsognathus. Of course, it may be that large size was a primitive feature of the neotheropods, with Coelophysis and co as later minaturised forms which continued through to the early Jurassic. Although the position of Liliensternus is uncertain, current phylogenetic analyses agree on a monophyletic Coelophysoidea (sensu Sereno), even if they disagree on details. Because -oidea is the suffix for superfamily, and this does not seem to be a very diverse group, we have taken the liberty of replacing this with a subfamily ranking of Podokesaurinae (although Cladistics is rank free, in this way the name can do double duty as a linnaean taxon). Podokesaurinae is here considered to include a number of species, all of which can be placed in the genus Coelophysis (the present writer (MAK) rejects the move to monospecific genera, as this results in a disjunction between paleoherpetology and the rest of biological nomenclature (botany, zoology, invertebrate paleontology e.g. brachiopods, molluscs, trilobites, etc)). There seems to be little agreement regarding the phylogenetic details here. Comments: Very lightly built, long bodied, head long, weak bite, numerous small teeth, crests absent (Paul 2010 p.72). There are two morphs, indicating sexual differences. 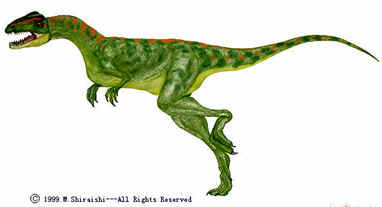 It was at one time believed that this animal practiced cannibalism (not uncommon among crocodilians), because some Ghost Ranch skeletons have juvenile-sized skeletons in the area of their stomachs, but thesewere later shown to to be misinterpreted (several specimens were actually small sphenosuchids such as Hesperosuchus, while in some cases it was simply that the remains of bigger individuals lay on top of smaller ones). 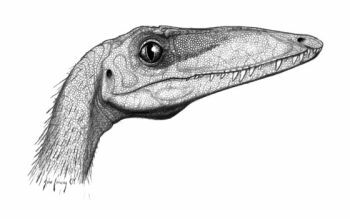 Comments: A descendent of the Triassic Coelophysis bauri, this active little animal shows a number of more advanced features, such as a much larger "window" (the antorbital fenestra) in the front side of the snout, possibly for housing a gland of some kind, and teeth that are entirely forward of the eye. There is also the fusion of some of the upper foot-bones (metatarsals), a bird-like characteristic that would increase the strength of the leg. The behaviour appears to be the same as C. bauri, for the remains of large numbers of this species, in various ages, are found concentrated together in a single small quarry area. Like present-day birds, Syntarsus seems to have lived in large groups or flocks of individuals (the species is known from at least 30 partially articulated skeletons, juvenile to adult, found in one locality). (Paul 1988 p.262f.). Leg longer relative to the body than C. bauri (Paul 2010 p.73). A related form, known from fragmentary remains, has been found in the Early Jurassic Lufeng Formation (Yunnan Province, China) (Irmis2004), showing that these animals had a global distribution. As with C. bauri, head crests are absent. Comments: Originally known as Halticosaurus; the specific and later generic name honours the German amateur paleontologist, Dr. Hugo Rühle von Lilienstern, who discovered the original fossils in the eraly 1920s. a poorly known form, consisting of disarticulated remains of at least two individuals, and fragmentary skull material. 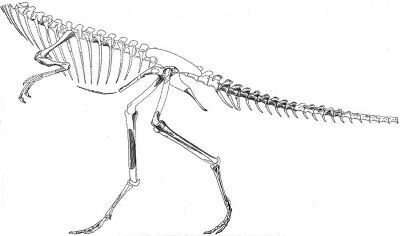 This was a lightly built animal, more like an oversized Coelophysis than a dilophosaur Greg Paul 2010) p.74) . Depending on who you ask, Liliensternus is either as a basal taxon of a monophyletic Coelophysidae (Ezcurra & Cuny 2007, Smith et al 2007, Xu et al 2009), or a derived/advanced taxon intermediate between coelophysids and dilophosaurs (Paul 1988 pp.267-8, Nesbitt et al 2009). Following Greg Paul (1988), this species is uniformly drawn with head crests, although it is not known if it actually had them. Lophostropheus (originally Lilensternus) airelensis, from the Rhaetian of France , known from partial remains, may be related, although it is different enough to deserve its own genus. About all that can be said of these poorly known animals is that they show that respectable sized theropods were around in the late Triassic. These animals were about the same length, but much lighter, then contemporary rauisuchian thecodonts; the two types of creature obviously filled very different ecological roles.